We began this 'go-home' edition of Championship Wrestling (before Nirvana In November) by previewing the upcoming show... First of all, later tonight Angry Gilmore and 'Mighty' Danny Cavanagh will sign their 'Career versus Career Match' contracts LIVE in the ring... The loser of their match this Saturday will LEAVE NOTBPW... We're also going to see Steve DeColt and Ricky DeColt in tag team action against The Mavericks... But... The announce team asked if there's a chance we might see the Coast To Coast Connection here tonight...?! The three big men have run roughshod over the NOTBPW roster thus far... Thoughts are that some of the guys they've taken out will return tonight to call them out!! Donte Dunn is on a roll right now, winning four matches in a row coming into this battle. The only problem with that mini 'streak' is that Primed For Progress had won their last FIVE! 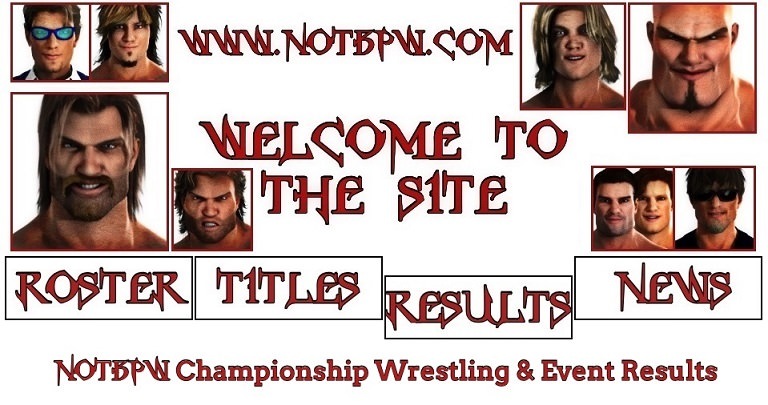 Including three matches for the NOTBPW Tag Team Titles! They weren't impressed with Wade Orson's actions, and they weren't phased by his selection of a team to face them tonight. Cameron Vessey took care of Donte Dunn on the outside, while Christian Price made light work of the distracted Erik Strong and put him away with his 'Stud Stopper' Stunner! Erik Strong was clearly at fault for the loss there, and Donte Dunn didn't seem too pleased... However, 'The Barbadian Barbarian' is a compassionate young man, and Strong is a good friend of his, so he consoled his tag team partner... Wade Orson tried to get his hands on Cameron Vessey and Christian Price, but they got out of there, sensing that the numbers game wasn't in their favour for a change... Vessey and Price shouted that 'this isn't over', because they still want revenge for what Orson did to their bags last week!! Next up, a live interview hosted by NOTBPW Announcer Tom Townsend... On the big screen, Dan DaLay and Alex DeColt were in separate locations... Thoughts are that Dan DaLay is at home tonight... resting up for his big match with Alex... The General Manager (Alex DeColt) is somewhere in the back... After all... He has a show to run... Townsend asked DaLay if he accepts the challenge of Alex to a match, at Nirvana In November... The winner of that match, will get the 'naming rights' to Alex's son, and Dan's Nephew, Logan... Currently, he's a DeColt... But if Dan DaLay wins, he'll be a DaLay!! Things got tense at this point, as Dan DaLay's comments cut deep inside Alex DeColt... DaLay continued though, and said that Alex should be treating a tag team like Los Monteros with more respect too... Gino and Luis Montero are clearly very talented, and they deserve the chance to shine here in Canada... Not be treated like dirt by Logan and Alex... 'The Mind' interrupted at that point, and slowly said that he can't wait to batter Dan DaLay at Nirvana In November... However tonight, Dan can watch as HIS son Robin takes on the aforementioned Gino Montero... and as Alex said, we'll see how good this Gino really is!! Robin DaLay [vs] Gino Montero w/ Luis Montero Jr.
Two youngsters with bright futures colliding here, but it was clear which one had the most talent currently. Gino Montero outperformed Robin DaLay from start to finish here, and finally put the 2o year old, one year pro away with his awesome 'Destiny Explosion' on around 8 minutes. Winner: Gino Montero w/ Luis Montero Jr. The next segment involved a lot of people... First up, NOTBPW Television Champion Sonny Wildside headed to the ring... He was attacked by the Coast To Coast Connection at Anarchy, and tonight, he was back... to call them out... But his Nirvana In November opponent arrived on the stage... Bryan Vessey told Wildside he should be more concerned with his upcoming Title defence... not a group of newcomers... With that, The Natural and Solomon Gold arrived, and walked past Vessey on the stage... They too were attacked by the CTC, and they stood in the ring alongside Wildside... But... they were out there to call out the tag team: Mayhem!! Aldous Blackfriar and Mutant soon arrived on the stage, and stood side by side with Bryan Vessey... Aldous did all of the talking as usual, and said that The American Blondes and Mayhem WILL fight in a tag team match... soon... But tonight... It'll be a singles match... Blackfriar's 'muscle' Mutant, taking on ANY of the three men in the ring... The Natural threw down his microphone and began taking off his jacket... Sonny Wildside placed his Championship Belt AND his microphone on the floor, but the young rookie Solomon Gold stepped forward... Still with a microphone... and said that HE would fight Mutant... right... fricking... now!! Solomon Gold was very brave to step up to the 360lb Mutant tonight, but he was no match for the big man's power. The match was as one-sided as they come, but Gold fought bravely, and made a good showing of himself. In the end though, he was squashed by Mutant's size, and then ran onto the 'Tina Turner'! An excellent tag team match here involving four experienced competitors. Steve DeColt and Ricky DeColt have great chemistry as partners, but they haven't been teaming up as long as The Mavericks have. John Maverick lead things, and he told Julian Watson what to do and when. However, blood is thicker than water, and the two DeColt Brothers soon proved this adage true. They made a few successful quick tags to regain the momentum, and then right as Steve DeColt hit his 'DeColt Stampede' (big boot) on Maverick, Ricky DeColt hit his 'DeColt .45' Super Kick on Watson. Ricky and Watson were the legal men, and Ricky pinned him to score the victory! Backstage, NOTBPW Canadian Champion Gargantuan bumped into 'Mainstream' James Hernandez – the former NOTBPW Television Champion, who held the Title for seven months until losing it two months ago... In that time, he went undefeated for the entire run (until it ended), and even DREW with the still undefeated Gargantuan... 'The Monster' has been a NOTBPW employee for twenty-one months, and the Canadian Champion for five... His match with Hernandez was the first and only time he didn't win... There was tension in the air between the two, but Hernandez smiled in the end... As he walked off, he wished the 7'1” 350lb beast 'good luck' in his match against 'The Ace' Aaron Andrews at Nirvana In November!! Fresh off the back of his rare win against the departing Hugh Ancrie last week, Mark Griffin was keen to follow it up with another win here. However, he was facing the experienced Samoan Akima Brave tonight, and he too saw an opportunity to pick up a win! Brave overpowered Griffin for most of the match, and was quicker to the punch too. He scored the win in the end following a 'Samoan Suplex'. Backstage, 'Cut Throat' Trent Shaffer and 'Awesome' Wade Orson were talking in the locker room, about the Coast To Coast Connection... The 'CTC' had previously attacked Shaffer, and he suggested that guys like them should stick together, to avoid being attacked in the future... Particularly after what happened to Thrill Seeker earlier tonight... At that moment, 'The Assassin of the Squared Circle' Ernest Youngman walked in, and said out loud that he'd been looking everywhere for the man he found... Shaffer and Orson thought he was talking about Orson, but he was talking about Shaffer... To the surprise of both of them, Youngman asked Shaffer to be the fourth member of his team at Nirvana In November, where they'll take on Orson's rivals Primed For Progress!! Aaron Andrews and Jack DeColt put on an amazing match here, and it was one of the best matches of 2017. 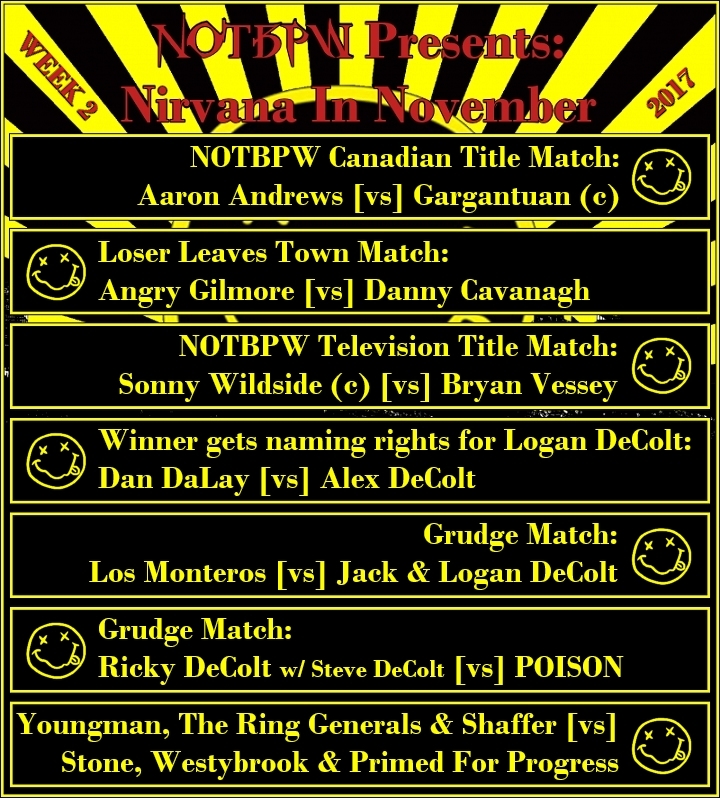 Andrews is fighting Gargantuan this Saturday at Nirvana In November for the NOTBPW Canadian Title. Jack will team with his Nephew Logan DeColt again, to take on Los Monteros, at the request of Alex DeColt. Tonight, Andrews was focused, and determined to score possibly the biggest win of his career against the legendary DeColt Brother. But with Logan in his corner, Jack was able to gain the unfair advantage a few times, and he came close to winning the match on more than one occasion. Late on though, to the shock of Jack DeColt, Los Monteros ran to the ring, and ran Logan off! They stayed at ringside, and continued to anger and distract Jack DeColt. He was then hit with the 'Hot Shot' by Andrews, and Andrews won it! 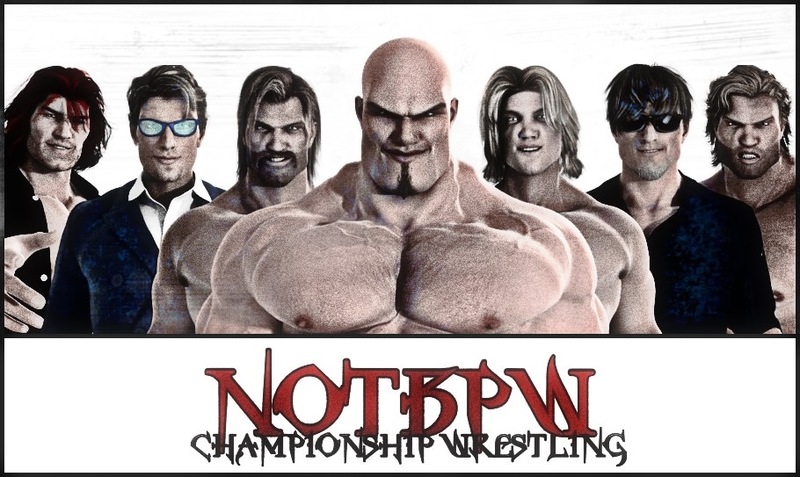 For the contract signing between Angry Gilmore and Danny Cavanagh, we got a rare appearance from Jeremy Stone, Dan Stone Jr. and Victoria Stone McFly... the three principal owners of NOTBPW... The Stones were there to oversee the contract signing, and make sure nothing went down between the two rivals... Their match at Nirvana In November will be a 'Loser Leaves Town' Match, with the winner being able to rid NOTBPW of the loser!! Things were tense between the two, but nothing went down, due to the presence of Jeremy and Dan Stone... but once the contracts were signed, an unexpected group showed up... 'The Coast To Coast Connection'!! The CTC, lead by the big man in the middle, spoke to Angry Gilmore, Danny Cavanagh and The Stones... They told Jeremy Stone and Dan Stone Jr. that they should stand down, and leave them to attack the two Main Event stars... but The Stone Brothers decided to stand and fight instead!! They both began removing watches and unbuttoning their cuffs... Just then, 'Mighty' Danny Cavanagh took an opportunity to clock Angry Gilmore from behind, and send him crashing into the bottom turnbuckle, hitting his face hard!! Cavanagh then jumped out of the ring as The Stones helped Gilmore to his feet... When Cavanagh got to the stage, he raised the CTC's hands... and he looked like he was WITH them... But the middle one ordered his men to attack, and they took Cavanagh down... stomping on his legs, arms and chest!! The CTC left the arena, as the show went off the air, with Gilmore desperate to get up and go after Cavanagh!! PGHW veteran PRIDE Koiso has been working hard lately, and experts believed he was only one small slip away from an injury... Unfortunately last week, that became true for the 41 year old... He will now miss an entire year of action, following a Herniated Spinal Disc, an injury he suffered during a match with Masaru Ugaki... It was Koiso's 11th match in November, after he and Kozue Kawashima went the distance to win the PGHW Elite Tag Team Series for the fifth time in ten years!! It's a shame for Koiso and Kawashima, because NOTBPW were going to make use of their working relationship with PGHW to bring the tag team in for the Ed Henson Memorial Tag Team Cup which will take place in February of next year... They won't make it now! !